From Ghandi to British student protests, from experimental Volvo factories to the ongoing institutionalization of Art Research, from the meaning of research to its embedded model of labour, from problems of verbalization to the invention of methods on-the-fly, from retinal or cerebral regimes to modes of know-see-feel: we followed Sarat Maharaj‘s keynote lecture and felt his attitude, his outreaching openness, his affinity to language, his power to create spaces and possibilities for further development, his drive to deepen the entanglements with his chosen topic and his wish to make offers instead of imposing solutions. In reply to the question of how critique would fit into his perspective on Art Research, Maharaj deployed his notion of sounding. He proposed sending out impulses and receiving a topological image of the surroundings as a reply – similar to sonar or ultrasound. Since several years he has applied the method of sounding to approaching complex subjects in a communicative sphere that is riddled with incompatible ways of living and knowing and filled with cultural difference and intranslatables (1). Critizing in such a sphere, which does not provide consistent cognitive parameters, languages and modes of experience, seems problematic and short-sighted. His rejection of critique parallels the arguments of Bruno Latour who claims that ”critique did a wonderful job of debunking prejudices, enlightening nations, and prodding minds, but […] it ‘ran out of steam‘, because it was predicated on the discovery of a true world of realities lying behind a veil of appearances.” (2) Furthermore Latour proclaims that what uses the sledgehammer of critique cannot also repair, take care, reassemble and stitch together. He thus propagates a ”compositionist” approach that does not rely on any world of beyond, but acts in conscious immanence and on the ruins that critique left behind. Compositionism takes the heterogenity of the assembled parts into account, has a close relationship to composition in the arts, and flirts with compost and its active de- and recomposition. As a further matter, it is open to compromise and in constant search for the Common (3). The present attempt of trying to combine sounding and the Common led to a concert Chris Watson gave in the Brussels Museum of Natural Science in 2010. Watson is an experienced and versatile sound recordist who has worked on numerous BBC documentaries in the most unaccessible regions of our planet. He is specialized in recording wildlife and natural phenomena. In the museum‘s whale room, he played his latest sounds of Orcas which he recorded during his recent expedition to Antarctica. Sitting under the collection of whale skeletons, suspended from the ceiling, Watson explained to the audience how whales use echolocation for hunting. They emit frequent clicks from a complex of nasal sacs in the blowhole region. 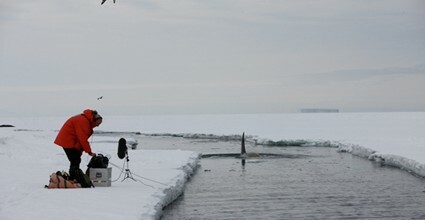 The clicks are reflected from the environment and received by the whales. Their brains can turn these sound-based responses into an image or map of the surroundings. Moreover, Watson explained that some biologists believe that whales cannot only emit the initial clicks but also retransmit the spatial response. This does not seem to be impossible, considering two facts: Firstly, the response merely consists of a sequential sound pattern. Secondly, whales have considerably bigger brains than humans and are highly specialized in communicating via sound and in using sound for navigation. The hypothesis even proposes that Orcas hunting in groups might be able to share their view on a scene with others that are positioned in different angles. Combining their perspectives into a collective three-dimensional map might result in considerable advantage. Even if this supposition of a shared, – or to use Maharaj‘s expression – ”agglutinative” perception/thinking of whales does not prove to be actually the case, it seems to be a good starting point to ponder about collective sounding, compositionism and further modes, channels and formats of exchange between people involved in Art Research and thus involved in creation.